The film finds the Cassidy family of Ballymoran coming home from a night of meteor-watching in the town square, only to find a bloated man in a shiny red bodysuit and bicycle helmet passed out on their living room floor. 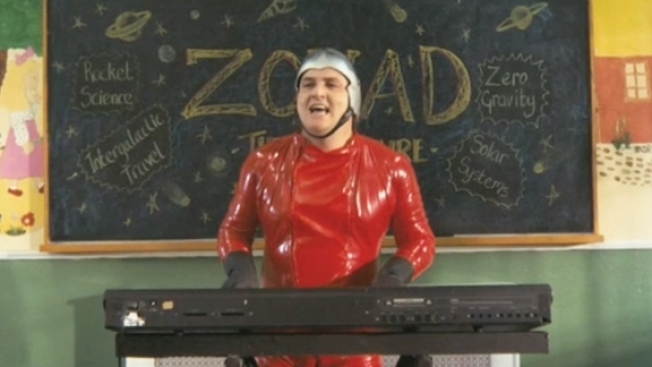 Upon coming to, the man introduces himself as Zonad, a traveler from outer-space who's fallen to Earth through a hole in the space-time continuum. The Cassidy clan accepts this explanation at face value and welcomes the strange visitor to stay with them. Soon enough, Zonad achieves rockstar status among the townsfolk, drinking with all the men and sleeping with all the women. But when Zonad's old friend shows up, Bonad, of course, he threatens to disturb the tiny little Eden our hero has built for himself. The town of Ballymoran is reminiscent of "Pleasantville," people with an "aw shucks" attitude dressed in a style evocative of the 1950s, though it becomes clear that the film is set in more or less the present day, making the entire premise all the more unlikely, funny and/or dumb, depending or your mood and dispostion. Simon Delaney gives a fine performance in the titular role, bringing a joyous, Belushian foolishness to the role, and David Murray brings a buttoned-down creepiness to his small, supporting role that would make Richard E. Grant proud. Once you give yourself over to its unapologetic stupidity, "Zonad" is hilarious. However, if you're not willing to commit as deeply as its stars have, you could be in for the longest 78 minutes of your life.